Some 15% of US broadband users that subscribe to a legacy cable, satellite or telco pay TV service are “to varying degrees” likely to cancel their service in the next six months, according to new research. 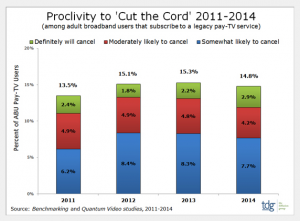 The research firm also claimed there is the continued absence of a “full-fledged over-the-top (OTT) competitor” and said that the proclivity to cut the cord among adult broadband users has remained virtually unchanged in the last four years. “While new media powerhouses including Amazon, Apple, Google, and Microsoft have been unable to build out a true pay TV alternative, by 2020 the pay TV landscape will look very different than it does today, with these four companies accounting for a significant and growing slice of daily video viewing,” said DFG. 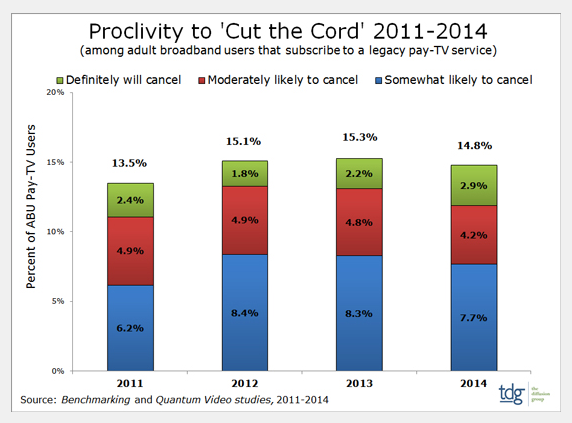 The study found that in 2014, 7.7% of adult broadband users are ‘somewhat likely’ to cut their legacy pay TV service. Some 4.2% were found to be ‘moderately likely’ to cancel and 2.9% said they will ‘definitely cancel’ – more than in recent years. The overall 14.8% who said they were likely to cut the cord this year compares to 15.3% in 2013, 15.1% in 2012 and 13.5% in 2011.